Update! 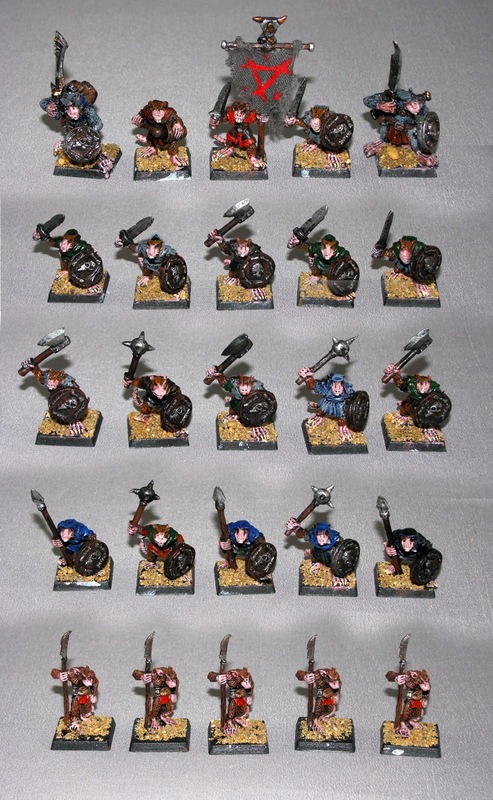 : Both this and my Undead Skaven army have been sold. Alas, it's time for the last of my WHF armies to go; farewell, my skittering hordes of vile ratmen. We had a blast, and I do mean a lot of blasts. 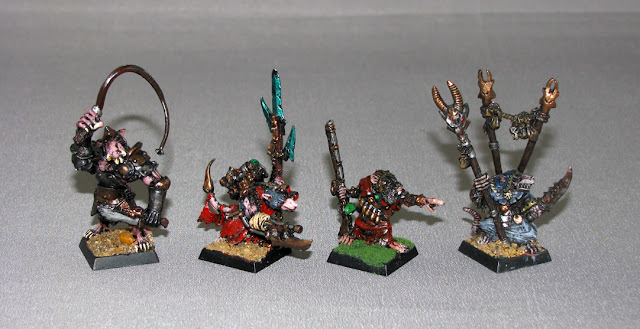 The skaven were an army made to go sideways, and you got a laugh out of it every damn time. A bunch of Black Tree Designs models (supplemented by 5 slaves from another range) these metal Clanrats were cheaper as a mob of 20 than a box of GW plastics. 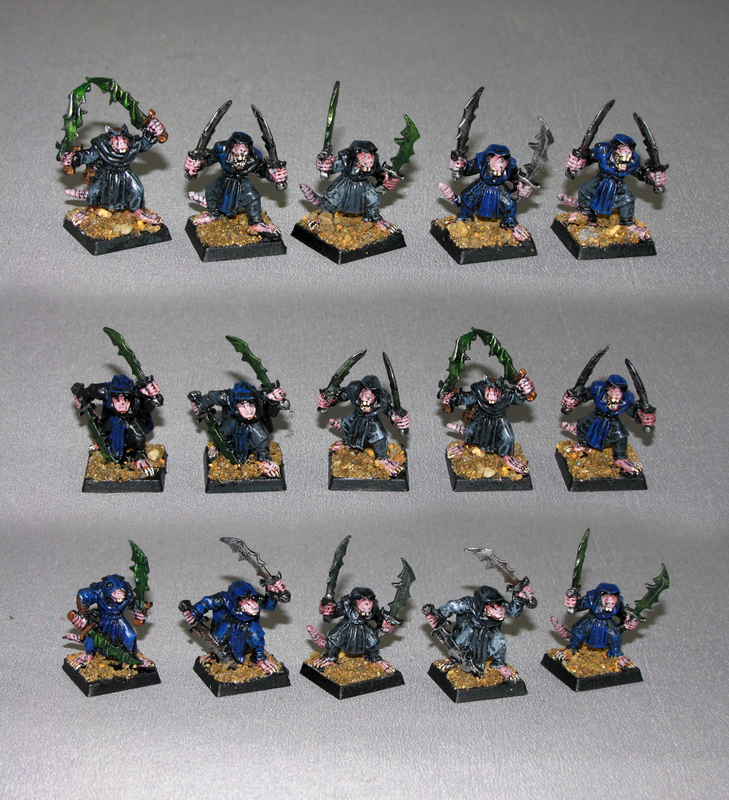 Ditto the Plague Monks, Stromvermin, and Gutter Runners below. They didn't come with banners, just poles, so I made some suitably ratty ones from actual cloth scraps from the lining of an old backpack. 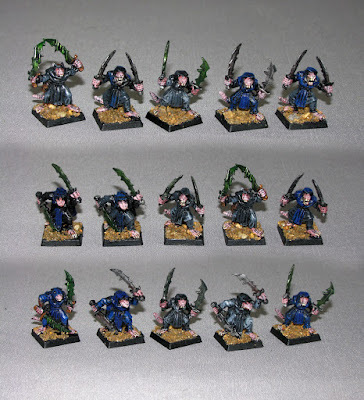 The frenzied plague monks were actually the best unit in the whole codex. 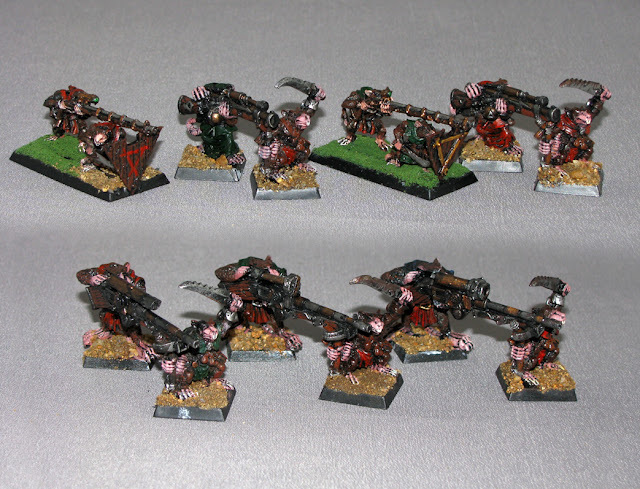 Their speed combined with multiple attacks made them an absolute buzzsaw. Didn't wear a scrap of armor, either. This sneaky distraction created as many problems as they'd solved for me, and more than once caused a chain-reaction panic run back to my edge of the board. The burly Master Moulder at the end was converted from a Reaper Orc. 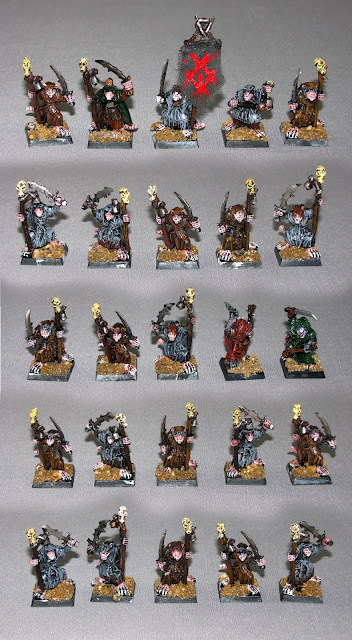 Some buck teeth and green stuff went a long way to making a buff taskmaster, and believe me, the skaven need keeping in line. I always liked clan Skryre, too. Their weird ramshackle inventions gave the army as a whole a lot of character. Perhaps my all-time favorite warmachine was the Doomwheel. 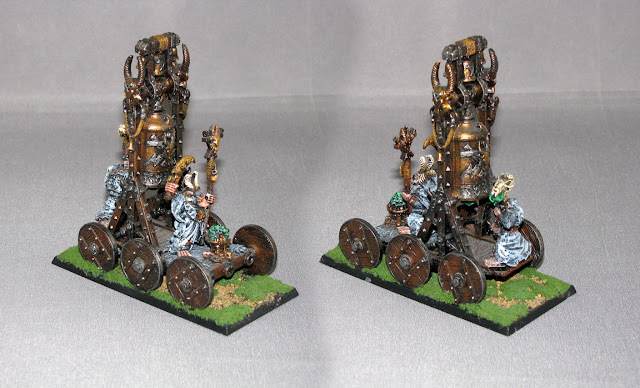 This one was built out of the parts I could order from the very much missed GW bits site. They didn't have all the bits on order, so I had to convert up the rest; the back cogs came from some dwarf warmachine or other from another range. Yes, those are are crossbows on the hubs instead of huge blades, which proved to be a boon in the long run because it's easier to transport on its side. It was great when it worked, but when the warp lightning cannon misfired, ooooooh boy. Kiss anything nearby good-bye. 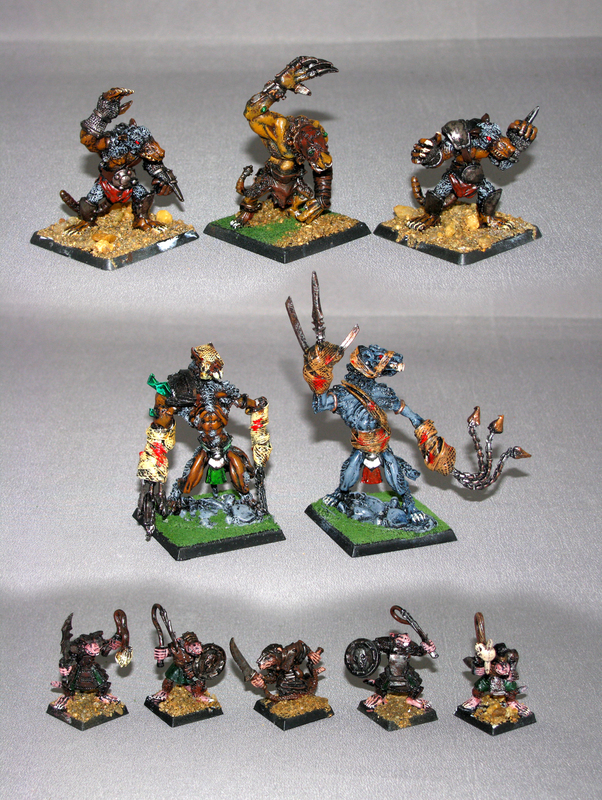 The two big Rat Ogres are, in fact, Reaper models converted up to be suitable ratty. At the time, like many others in this army, they were substantially cheaper than the equivalent GW models. Only the one in the middle of the upper 3 is a GW one, in fact. The other two are also from Black Tree. While the unreliable Warpfire Thrower always worked reliably for me, the Ratling Gun once scythed down two blocks of my infantry like so much wheat. I never laughed so hard during a wargame in all my life. Buy them together with my undead horde and you get a truly monstrous army LOL. 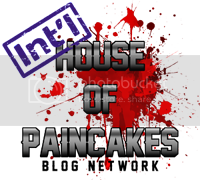 Why not subscribe to my tumblr feed, while you're at it? 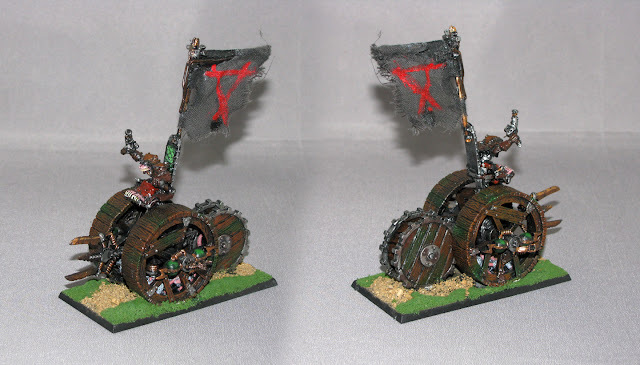 I paint (and convert) all manner of vehicles, minis, and so on for money. Interested ? Questions about pricing, etc? Drop me an email. I'm Mark, and I like making things. I know you're out there, I can hear you typing. Horus Heresy Book 8 - Malevolence - Daemons of the Ruinstorm. 2016 - III - More Relics minis and the next batch of projects. Legion of Plastic is Dead! - Long live the Iron Sleet! 3++ is the new black. Which To Choose:Immortals or Warriors? Legalese, so we don't get sued. Awesome Inc. theme. Theme images by hdoddema. Powered by Blogger.